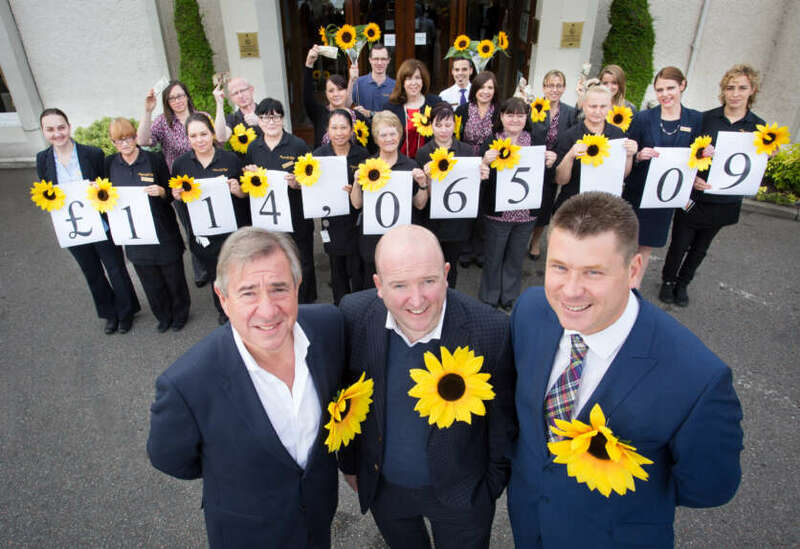 Staff of the Kingsmills Hotel in Inverness have smashed their fundraising target of £100,000 which they pledged to raise for Highland Hospice’s Project Build Appeal. Over the past two years, associates from every department across the hotel have been involved in a variety of activities, resulting in the phenomenal donation of £114,000. This sum is funding one of the new patient bedrooms within the Hospice's brand new Inpatient Unit which is due to open its doors to patients next month. Amongst their fundraising activity, the hotel staff have set up bars and coffee bars at various sporting events, done bungee jumps, trekked across the Grand Canyon, held a masquerade ball, asked guests to pay £1 if they enjoyed their stay, sold tickets for the Great Highland Car Raffle, hosted a quiz night and held two golf days with charity dinners. Incredibly, the hotel's golf day and dinner which was held on Friday 30th September brought the total pledge from £93,000 to £114,000 within just three hours. The inspiration for the drive to raise £100,000 came from their Managing Director, Tony Story. Highland Hospice holds a very special place for Tony, his wife Anne and their family. Like many families in the Highlands, their families have been supported by the Hospice and they have felt a great comfort from the gratitude for the care they have received. Kingsmills Hotel General Manager Craig Ewan said, "When Tony approached me and said he wanted us to commit to raising £100,000 for this fantastic new facility at Highland Hospice, we had no idea of the challenge that lay ahead of us. It was only when we got to around 20% of our target that we realised it was going to be more difficult than we had initially anticipated. We are fortunate in that the Highland community are so very generous, but there are so many very worthy causes and only so many people able to support them." "Full credit to our team who really took to the challenge and helped and supported each other throughout. Every event counted and was very much appreciated and I really must thank my team with all my heart." He added, "I am still on such a high after our golf day on Friday and I would like to thank the guests who attended for making the event a success through their kindness and generosity. Thanks to our raffle and auction donors for such wonderful prizes, all our suppliers and to Nairn Golf Club. Having received such great support and feedback, I am keen to repeat this event next year." Highland Hospice Chairman Norman Macdonald said, "On behalf of everyone at Highland Hospice, I would like to say a heartfelt thank you to Tony, Craig and their entire staff who got behind this pledge. For one company to have raised such a huge sum is truly inspiring and shows real commitment to the cause. Their incredible efforts really will make a huge difference to our patients and their loved ones who will benefit from our neew facility in the future. I honestly can't express our gratitude enough to everyone involved."